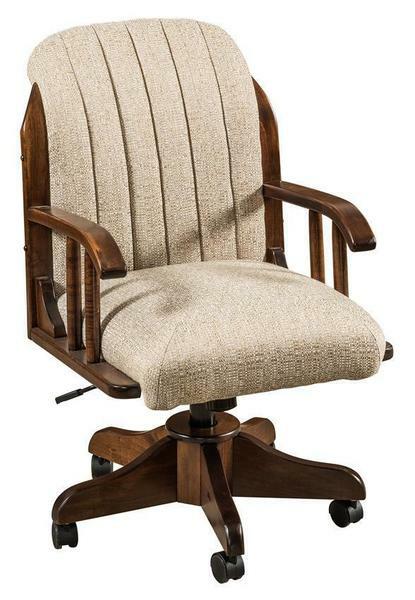 There's no doubt the Amish Delray Upholstered Desk Chair provides maximum comfort as you work. Select this chair that you can sink into for your desk, conference room or sewing room. With premium quality upholstery lining the back and seat, the Delray offers the coziest seat in the office. The Delray offers arm support as well, with generous and curving arm rests built into the design. With wheels that make it easy to transport and a gas lift option to adjust to the perfect seat height, the Delray is full of function in addition to its stylish form. Coming from a wood shop in northern Indiana, the Delray Upholstered Desk Chair is crafted for comfort. Your choice of solid wood defines the base with the stain you like best adding to a perfect finish. We are happy to send samples for you to work with. Chairs are hand sanded for a silky smooth finish and it's your choice of fabric or leather for the upholstery. The Delray is shown here in quarter sawn white oak wood with Michael's cherry stain. Quarter sawn white oak wood is cut in a unique way. This contributes to its strength and resistance to cupping or warping, as well as leaving a unique grain pattern that features the organic beauty of the tree. We offer the Delray in a cozy swivel bar stool option as well. DutchCrafters does it right for fine home furniture collections as well as fine furniture for business. Supply your office with Delray chairs for the conference room or for your reception area. Visit our Contract Sales Page for more information on custom quotes and trade discounts. Overall Height: 36 - 39 1/2"
Seat Height: 18 1/2 - 22"
Arm Height: 25 1/2" - 29"